There are continuing demographic differences between the student population and the teacher population. These differences maintain significant social and cultural gaps. Some investigators (Solomon & Levine-Rasky, 2003; Arthur & Collins, 2010) suggested that, without intervention, pre- service teachers may accidentally stereotype students and families and respond to them in oppressive ways. Students from cultural and linguistically diverse backgrounds which are different than those of teachers often perform poorly in public education. Students are at risk for achievement gaps, over representation in special education, high suspension and expulsion rates, and high drop-out rates (Jencks & Phillips, 1988; Losen & Orfield, 2002; Townsend,2000).The purpose of this study was to understand the changes in cultural competency among undergraduate students. The research question was "What changes occurred in intercultural competence among pre-service elementary school teachers from initial enrollment until beginning of student teaching?" This research project is based on the Developmental Model of Intercultural Sensitivity (DMIS), originally described by Bennett (1986; 1993). With concepts from cognitive psychology and constructivism, Bennett described intercultural competency as “the way a person understands, feels about, and responds to cultural differences” (2010). The DMIS presents predictable stages through which people progress as their cultural competency increases. The results of this study will contribute to information regarding the impact of the teacher preparation programs being used in the College of Education (COE).The university may use this information in considering the effectiveness of its cultural diversity goal: experience diversity with supervised reflection and recognize and respond to conditions of marginalized populations. Johnson, Mercedez; Elizabeth Hall; and Mariah Adams. "Changes in Intercultural Competency among Undergraduate Students in Elementary Education." 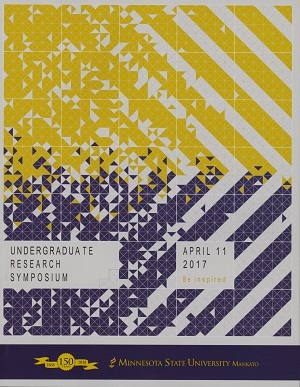 Undergraduate Research Symposium, Mankato, MN, April 11, 2017.